A few weeks back we went up for the afternoon to Austin to see my sister-in-law and her husband. 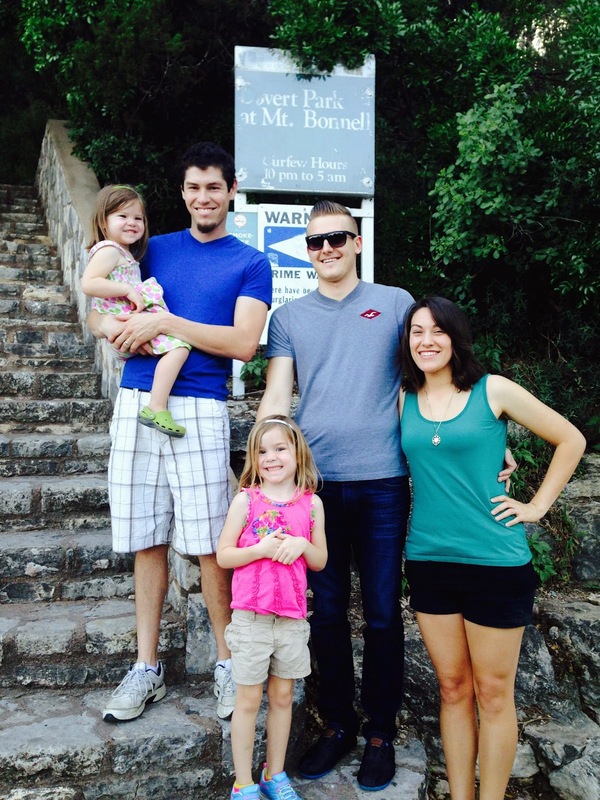 We told them we wanted to check out Mount Bonnell. So, we planned to meet there. We ended up getting their early so since we saw a sign for some kind of natural preserve on the way we decided to check it out for a brief second before they would meet us. I made another post about the Mayfield Natural Preserve here. It's an operating event center that just has wild peacocks walking around!! Yes, I said peacocks! It's totally worth checking out and I would hit them both up the same day if you're in the are since they are practically just down the street from each other. ...we did the stair master all the way to the top. Yes, all it is is a bunch of stairs to the top of this mountain. It took us maybe 4 minutes to get to the top. Really quick and easy. But once you get to the top the view is awesome!! 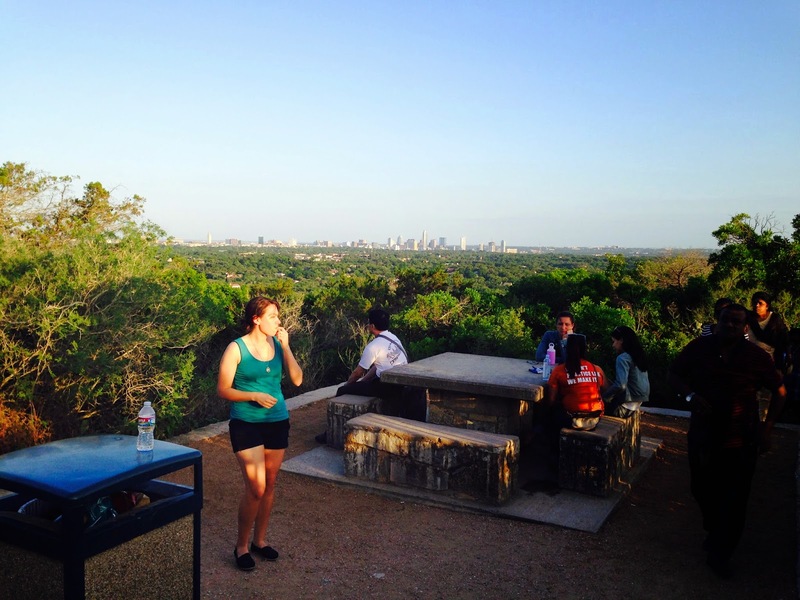 For such a short little climb you can see around the whole city of Austin! It's gorgeous. The mountain is set right on the edge of the Lake Austin portion of the Colorado River. So you can see the river running a Loooooonnngggg way down below you. Actually we read the little plaque that's at the food of the mountain and it explained that way back when there was a PR stunt pretty much and some lady made a zip line and jumped off Mount Bonnell and went all the way across the Colorado River to the other shore. Just a fun fact to tell your kids when they're looking down that huge mountain at the water, ha! Anyways, there are some picnic tables up at the top so feel free to pack a lunch for the family. Although, we went on a Saturday and it was pretty busy and no tables were unoccupied. Wonder if during the week would be less crowded. We came just before sunset so maybe that's why it was so busy. 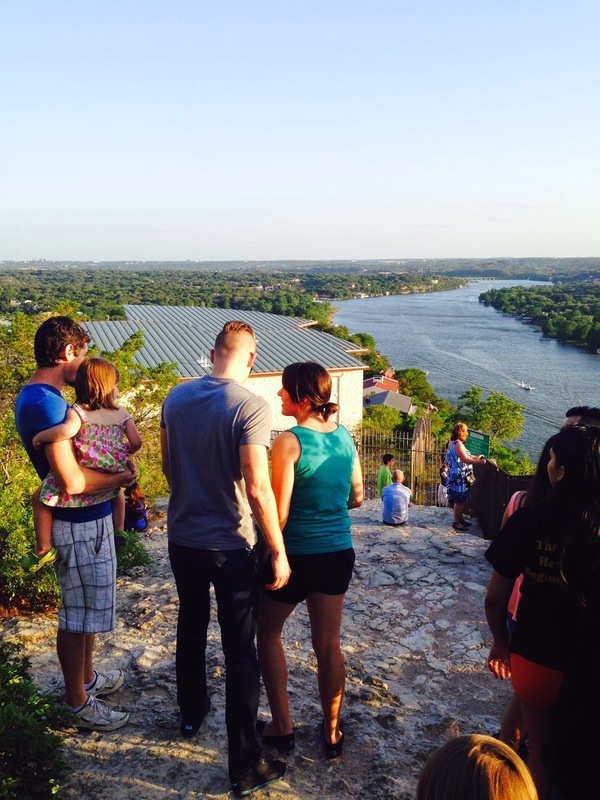 So, the next time your in Austin take a quick set of stairs up Mount Bonnell for a terrific viewpoint!! And don't forget to check out the Mayfield Nature Preserve just down the street.